The focus of this blog tends to be on my forays out , usually into Cardiff city centre, of a lunch time and it is nice that Cardiff has a decent spread in terms of what is on offer across the range, with posts from me covering both sarnies, the more upmarket fixed price menus at places like Asador 44 and the bits in-between like Chai Street, 3Bs and Gina’s cafe. 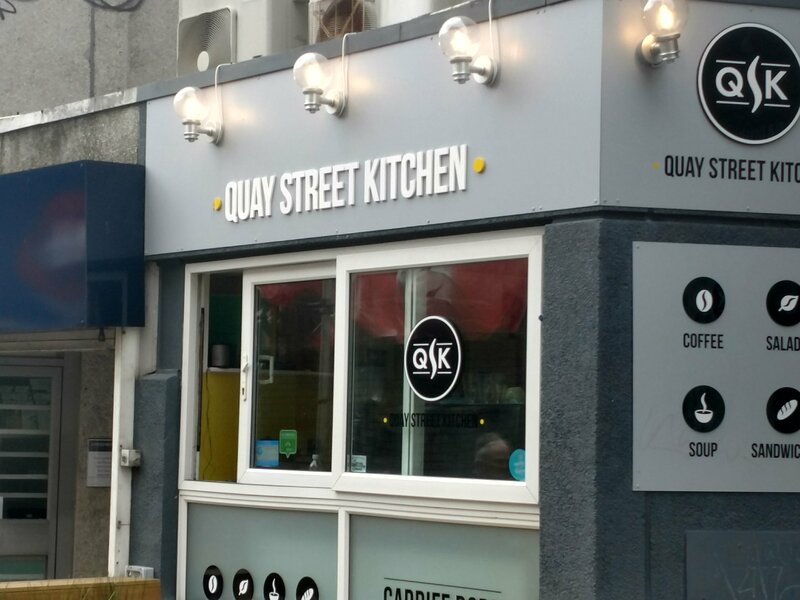 Quay Street Kitchen operates at, I think, the top end of what Cardiff has to offer on the sarnies and salads front. 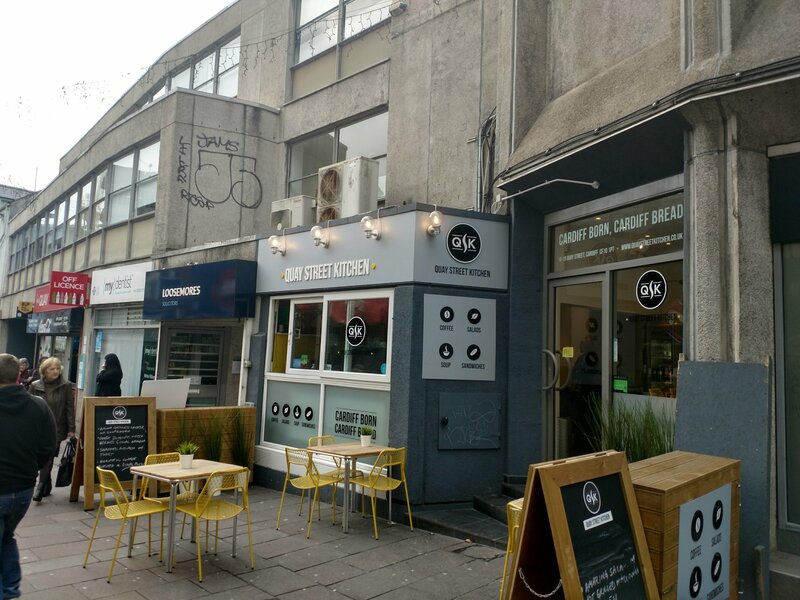 I have walked past the place on many an occasion (usually on my way to Asador 44 or Bar 44) and recently noted it had been tarted up inside and out and the food offering given what seems like a major revamp. As a result I was drawn in one lunch time to give the place a go. The place, it is fair to say, is mainly set up for the takeaway (back to the desk) crowd. 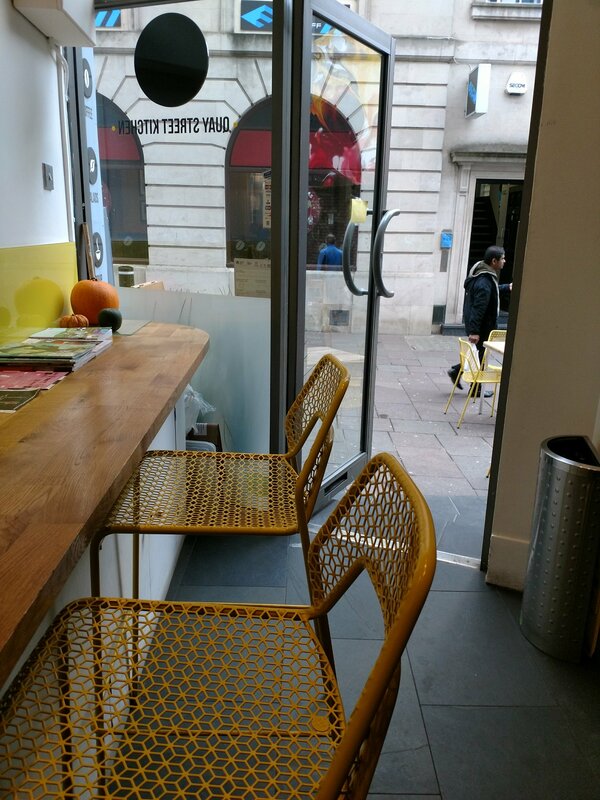 It does, however, have a number of seat both inside and (if you are brave – in this weather) outside. The seating area is limited, but comfy enough (if someone – unlike me – closes door when they come in). I happy sat in eating my food, with the two ladies running the show very chatty (in a nice responsive rather than obtrusive way). They seem to have a loyal customer base whom they know well. I like that. 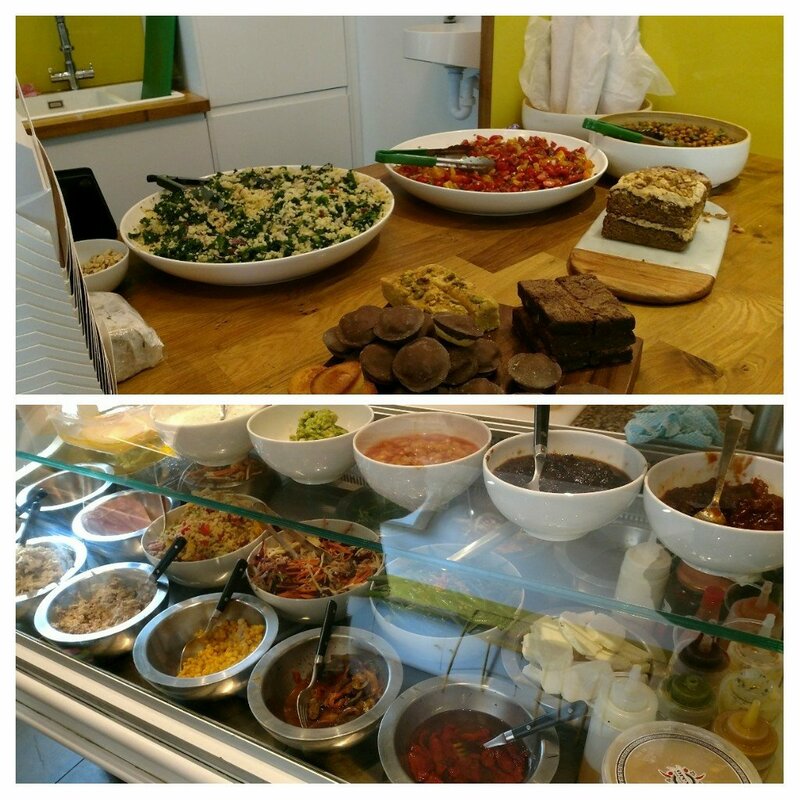 The food is sarnies, salads and soups, but you are looking at a cut well above you standard supermarket/sandwich bar fare. Quay Street Kitchen, to my mind, sits at the more upmarket end of the sarnie spectrum in the City Centre. Outside is a chalk board sign, with details of specials. It was brisket on the day of my visit. I love properly cooked brisket (got to be one of the tastiest cut of beef), but it is an absolute horror if done badly (tough as old boots and dry as the Atacama). I had decided before I got through the door that it was what I was going to have, but there is always an element of trepidation when it comes brisket (will they have treated it right). One look at the menu on the wall, however did give me more than pause for thought. Nice sounding sarnie combos had me wavering a bit, but the grilled cheese in sourdough offering really have me really questioning my choice of the brisket. 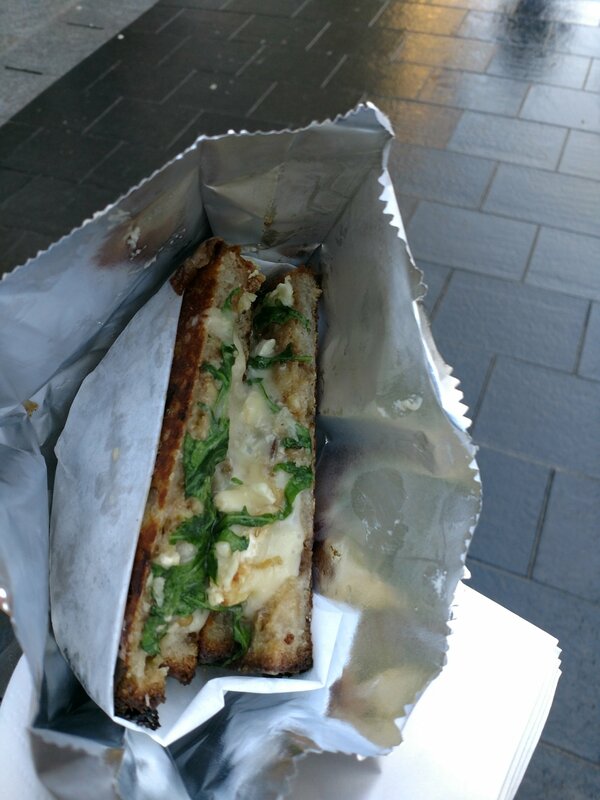 The brie, pear, walnut and caramelised onion number had me thinking back to toasted cheese creations I have had from, that cheesemeister par excellence, Mr. Croquewich. On top of the sarnies, the salads looked rather lovely and far from your run of the mill offering. Soups is also available, but I couldn’t say what it was on the day of my visit. Finally the cake selection looked to be rather fine. Despite having wavered a bit in terms of my brisket choice, I stuck to my guns and it was then a question of having it in a baguette, a sandwich or a wrap. Deciding on a sandwich with my brisket I was presented with yet another choice in the form of brown or white. In my opinion there is a reason people in the Mediterranean live longer than those in the US and Northern Europe and that reason is brown bread (rarely see it in the Med, but it is everywhere in the North of Europe and the US) – eat it and you’ll peg it before your time is my view. Is it a coincidence brown bread rhymes with dead? I think not (when they interview centenarians and ask them what they attribute their longevity to not one, I tell you, has ever said ” It is all the brown bread I have eat”). Needless to say I went for white. Very decent sarnie this. The brisket had a deep rich umami packed flavour to it and was melt in the mouth tender. Good meat to braising liquor ratio and there was no hint of dryness to the meat (which can blight brisket). Very generous filling which got in my newly grown beard (big draw back of a beard as far as I can see is its ability to drawn in food titbits – at times I feel like the Radagast character from the Lord of the Rings books not the one in the truly rubbish films of the Hobbit – how can you make 3 tediously long and crap films out of such a short but good kids book – this is from a big LoR fan). On top of the brisket was a punchy red cabbage slaw with horseradish in the mix (I would have preferred the horseradish to have been a bit more basal clearing and pungent if am honest, but it was nice enough), as well as some sharp, grated, cheddar cheese. Both work well as a counterpoint to the richness of the meat. In terms of the sarnie the only slight disappointment was the bread. This was a bit regulation white slice for my liking. I note the toasted cheese sarnies use sourdough and would have preferred a more interesting (white not brown) bread with my brisket. Minor quibble though. 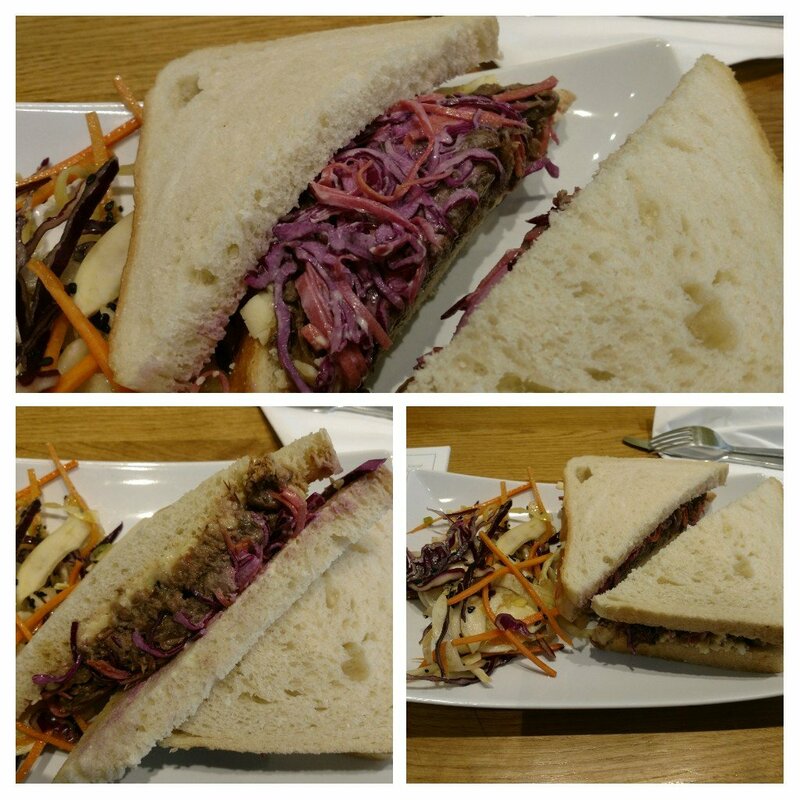 My, eat in, brisket sarnie came with a very nice fennel and carrot salad (sprinkled with black sesame seeds). I very much liked the crunch and anise flavour of the fennel as against the soft, rich, brisket. All in all a very nice lunch, which I thoroughly enjoyed. Can confirm that their toasted cheese sourdough sarnies are stonkingly good. Great flavour combos and loads of uber gooey cheese. On the drinks front they have the usual suspects on the soda front, but as it was a chilly day I fancied a coffee and noted that their house coffee offering is roasted in Dina’s Powys (by the people behind the Plug I believe). A very nice coffee this, with lovely sweet mocha and fruity notes. I rather liked Quay Street Kitchen. 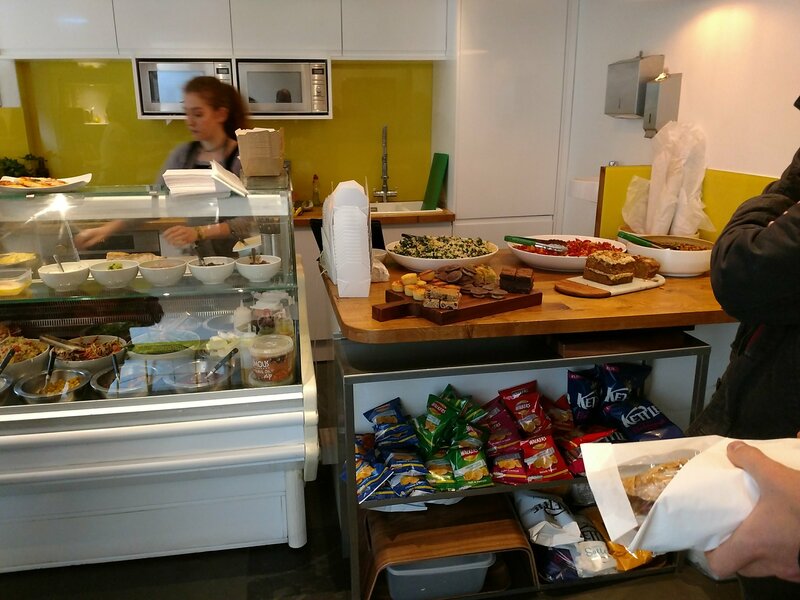 Interesting salads and sarnies, with good favour combinations and very generous portion sizes mean you are not going to go away hungry from this place. 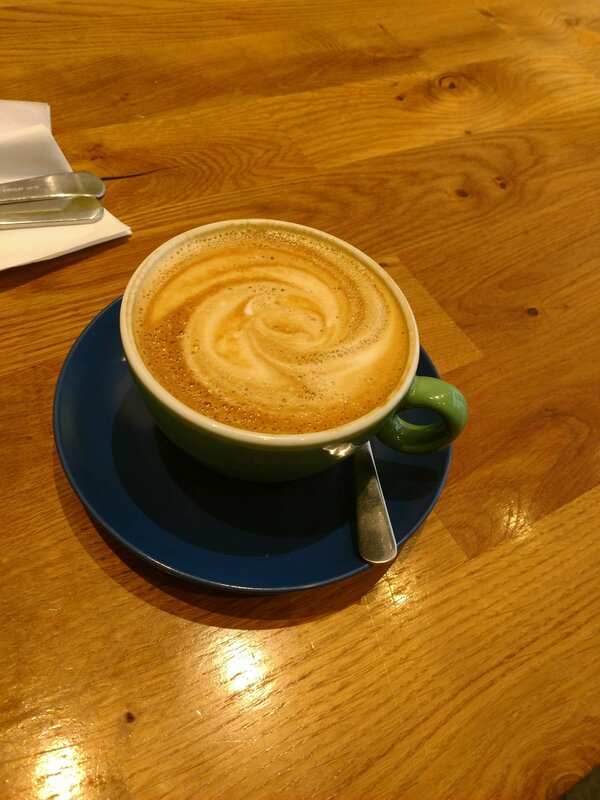 Add to that very nice coffee and some engaging staff/owners and you have one to the add to the list in terms somewhere to get an upmarket sarnie or salad in the city centre. Price wise it was just under £8 (I think) for the sarnie, one salad and a coffee. Not cheap, but a fair price for what I got I thought Your can eat well here for a £5 takeaway, which I consider to be good value. 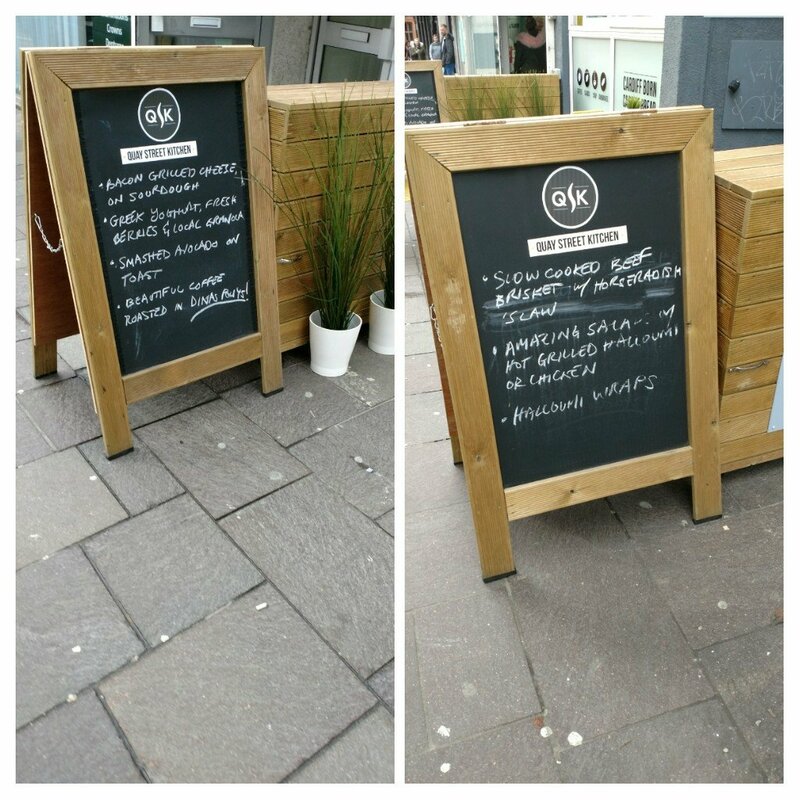 This entry was posted on Nov 26, 2017 by solicitingflavours in American food, Bacon, beef, breakfast, Brisket, cafe, cake, Cardiff, cheap eats, cheese, coffee, Fast food, Food, Lunch, lunchtime, Non alcoholic drink, Quay Street Kitchen, restaurant review, review, salad, Sandwich, Take away, Takeaway, Uncategorized, Wales.